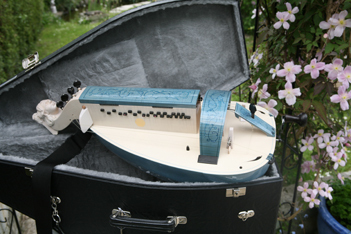 Very beautifully built Hurdy Gurdy from famous hurdygurdymaker Claire Dugue from England. The instrument is a masterpiece, made from the finest woods, maple, the keys are in pearl mutt and ebenholz. 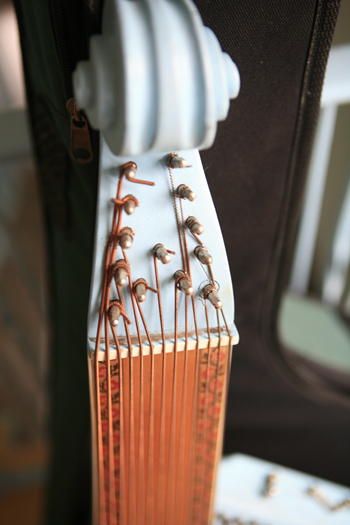 It has a beautifully carved head and precise mechanics for the tuning of the strings. 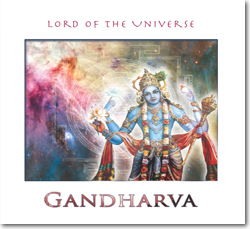 It is painted in transparent blue harnish with celestial ornaments and birds. 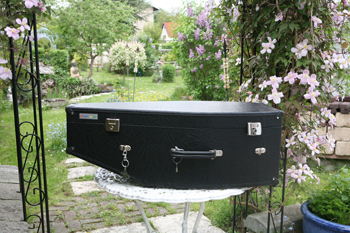 It comes along with a strong flightcase, which protects the hurdy gurdy. 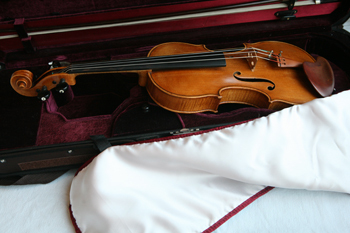 This wonderful violin has a very beautiful shaped body and is built in the italian Amati style. It was produced in Czech Repuplik 50 Years ago and has a very easy to play soundboard. The violin was used extensively by a young violin player 30 years ago and is now renovated by one of the most famous violin makers in Vienna/Austria with a new sound board, new strings, new bridge and soundstick. The violin is for a young violin player or a student or even for a beginner, who wants to upgrade his cheap instrument to a professional grade one. 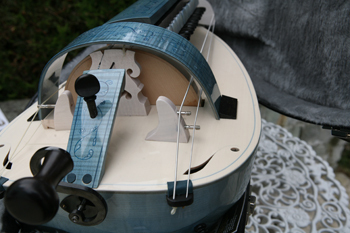 The violin comes with a medium quality bow and a new supercase with hygrometer. 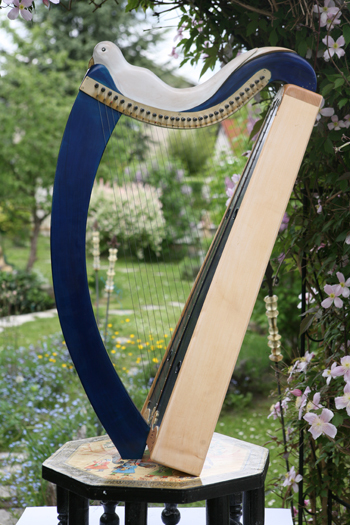 This metal strung harp is made extra for me from the famous harp maker Franz Reschenhofer from Austria. 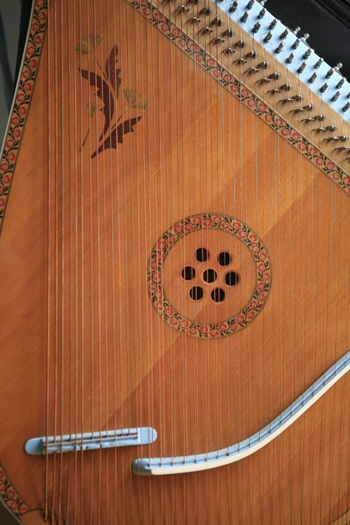 It is a historical rebuild from the original Brian Borus Harp from the 15th century. 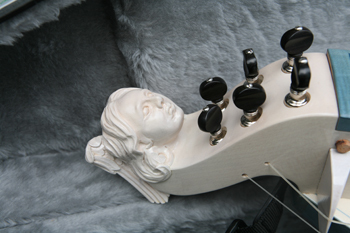 We added some nice ornaments to the instrument and it has a white dove carved in the wood. The sound is brilliant and makes you dream or cry. 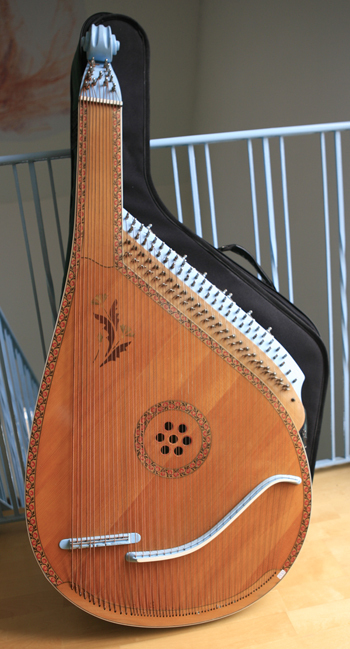 This celtic harp has steel strings on, so the sound is very clear and pristine (like bells). 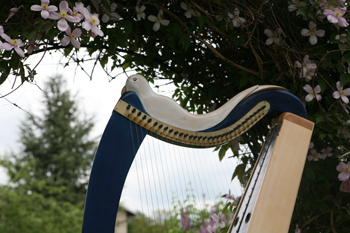 The harp was recently redesigned and has now a blue colour on the soundboard. 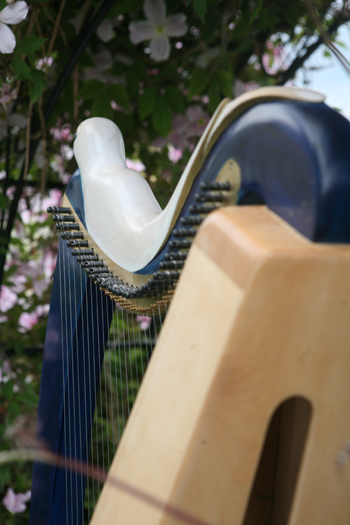 This harp is a magical instrument. It is so beautiful and clear, the sound is very pure and clear. It has a cristalline energy and is tuned in Eb. 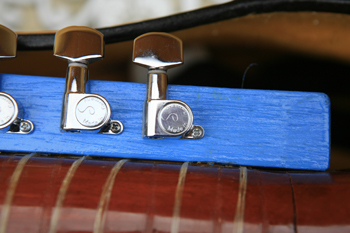 It has no half tone levers, but can be tuned in every key. It comes along with tuning key and protection bag. 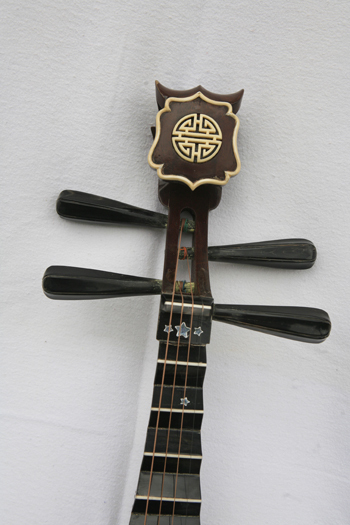 This is a very special Instrument. 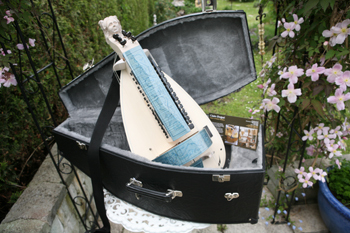 It is a mixture between a Zither and a metall strung harp. The sound is heavenly and it is played with 2 hands. The instrument is quite common in the Ukraine and this is a professional instrument with all the levers working perfectly. I heard some years ago a russian Bhandura playing girl, this was one of the most beautiful performances I had ever heard. 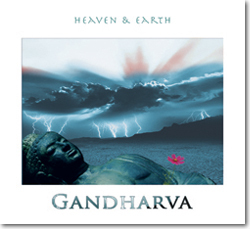 The harp (bhandura) was sounding like heavenly bells, crystalclear and very resonant. I tried to buy my own instrument, but soon I found out, that it is too risky just to order one instrument. I asked my russian friends from Kiev to go and look for a really professional instrument for me. 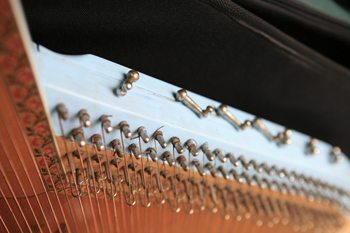 They found one instrument in soloist quality and the instrument was a big bhandura with all the levers to change the keys. I bought the instrument and I had it with my harpmaker, to polish it and check, if the mechanics are accurate and in tune. When everything was OK, I had a super Instrument. Some time later I meet again the Bhandura girl and she played the instrument at the classical concert in New York. 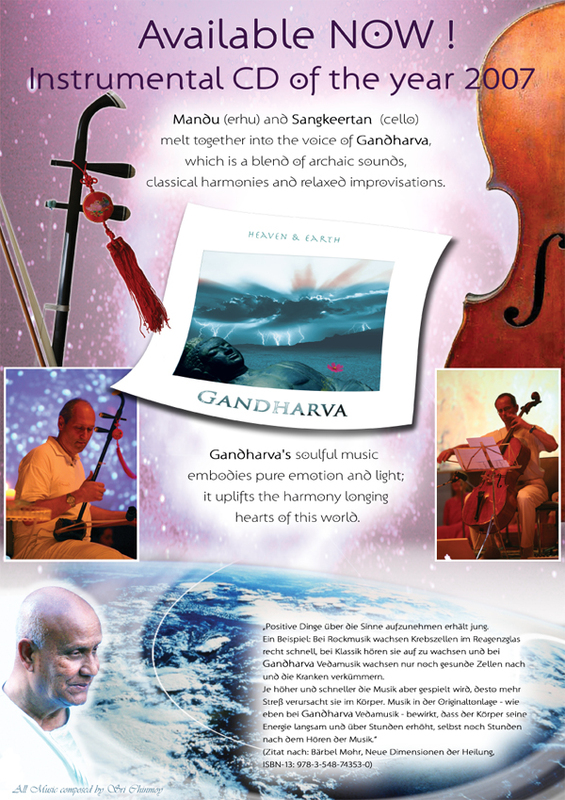 She said, she had never played on such a good instrument before, the sound is very clear and resonating and the instrument is very easy to play. But she could not afford that instrument, so she stayed with her cheap one. I am offereing this instrument to real professionals, people, who know, how difficult it is to get a good instrument and people who can appreciate the sound and the charisma of the instrument. It was once played in New York at a classical concert. I wanted to play this instrument, but I am learning the classical harp and I found, there is no time left to learn another instrument. It is a instrument for professionals. I had it checked and adjusted (regulated) from my harpmaker. 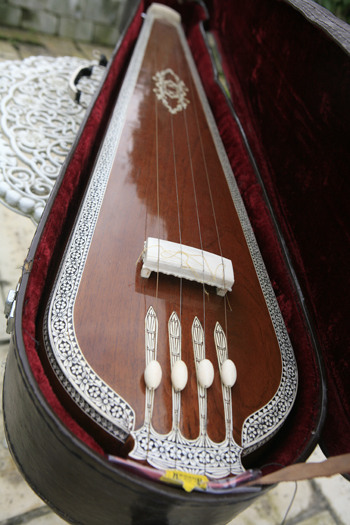 The instrument is in top condition and ready to play. The instrument comes along with a protection bag. 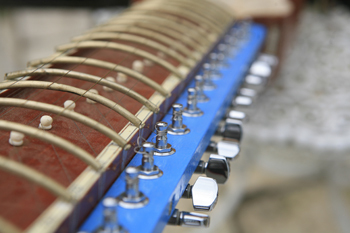 This Dilruba is a bowed string instrument, which sounds wide and transcendental. 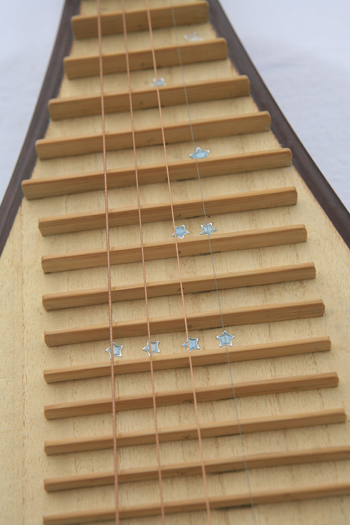 It is bowed and easy to play as there are frets. It comes in a original box which looks used (even when it was new). The hand hold is broken. The instrument was upgraded with original "Schaller" Mechanics from Germany, so it can be precisely tuned, which was difficult with the wooden plugs. Now it is a precise instrument, which produced a lot of overtones. A great Instrument for a great music. The instrument will cost EUR 550,- plus shipping. 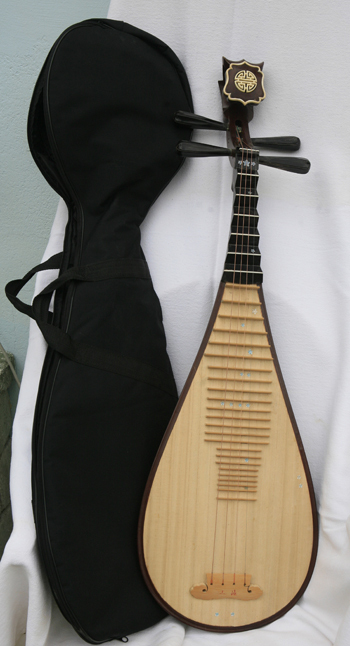 This Pipa was bought during a concert tour in China and I did use it for some recordings. The instrument was - as all my instruments - one of the best in the music shop there. It has a very sweet mellow and bright sound. 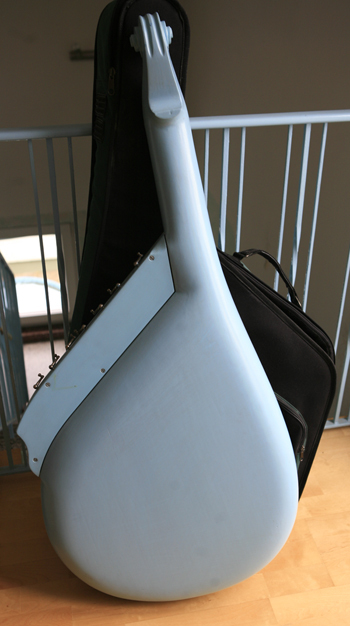 The instrument is ready to play and comes with a carrying bag. 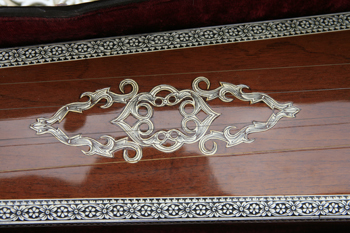 This tanpura is made with a wooden body and resonates really strong and full of sympathetic notes. It has a professional sound, perfect to use for recordings and concerts. 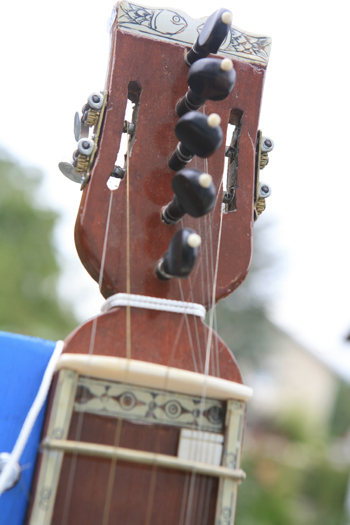 The instrument can be tuned in different ways. Please be aware, that the instrument is for Sound specialists, who look for the best. 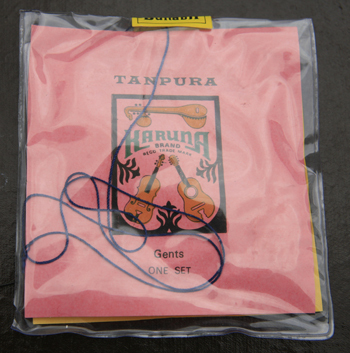 It comes along with a protection carrying case and an extra set of strings. Pictures will follow very soon.